Run all types of hills. Short and steep, rolling hills, and long gradual climbs. They each have their benefits. Short steep hills build explosive power and strength as well as cardiovascular fitness. Find a hill that you can run up in 10-15 seconds with a grade of 7-10%. Between each repeat take a full 2-3 minute recovery before you go again. Repeat them 10-12 times. Rolling hills teaches you to maintain your pace and form when going up and over a hill. You want to maintain the same effort on the up and on the down. This means your pace on the up will be slower than on the down, but it evens out over the entire hill. This strategy also reduces the possibility that you will bonk before the end of the run/race. Long gradual climbs of a mile to a mile and a half builds endurance and mental strength. All runners know staring down a giant hill at mile 20 or 22 can be a huge mental challenge. Training to get up and over these giants will build your endurance and confidence. You can also increase your ability to run uphill by making sure that you hold the proper form. Running uphill requires you to fight against gravity. The slope also causes you to land on your mid-foot and forefoot more. Your calves and ankles are under more pressure to propel you up the hill. The mistake many runners make when going uphill is too much forward lean from the waist this limits the power you will get out of your hips and knees. You can see this if you stand up and raise your leg standing straight and bent forward at the waist. Focus on standing tall and driving up the hill with your hips. What about strength training and plyometrics, will those help? They will help, but nothing beats the actual running of hills for training benefits. Squats, jump squats, hamstring curls, and lunges both with and without jumping are all good ways to increase the strength of your legs for climbing hills. How often should I be running the F***ing hills? 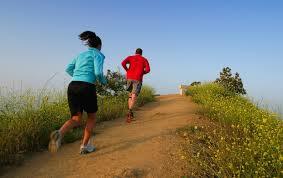 It depends on your experience, if you have never run hills add in a hill training once every ten days. Monitor how you feel afterward and your recovery time. If you are recovering quickly and not sore more than a day or two, add a hill work out into each week. Experienced runners who have completed many marathons and have been training for more than two years and are not injury prone, can add in two hill training sessions a week. Elite athletes are running three or four hill training sessions a week, but they also train twice a day, morning and afternoon. Next Article The marathon is 26.2 miles right, then why does my training only take me to 20 miles?